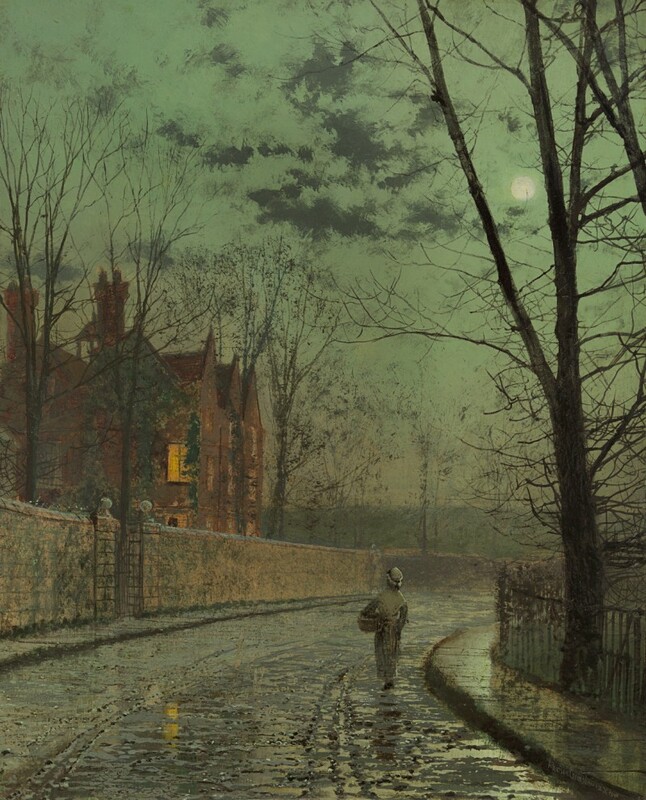 During the 1870s, Grimshaw became famous for his sombre nocturnal scenes of suburban lanes around London and Leeds, with leafless trees silhouetted against the moonlit sky. After the shower also displays the artist’s study of cloud formations and their effect on the quality of moonlight. In his celebrated work, Modern Painters, John Ruskin applauded Turner’s attention to the atmospheric effects of cirrus clouds, evoking both ‘the serenity of sky and intensity of light’. Absorbing these important principles, Grimshaw developed the moonlit scenes which were to become synonymous with his name and are perhaps the most characteristic of the artist, unrivalled in his depiction of evening twilight. Grimshaw’s iridescent, viridian sky and its reflection on the wet road are skilfully juxtaposed with the warm brown, brick manor, whose artificial light emanates a hospitable glow. Grimshaw was fascinated by the stately mansions of Victorian Leeds, a golden age of architecture. Knostrop Hall, the artist’s home for twenty-three years from 1870 until his death in 1893 at the age of 57, was often the inspiration for fantastical composite buildings in Grimhaw’s lane scenes. The move from Cliff Road, Woodhouse to the village of Knowsthorpe two miles east of Leeds signified the artist’s success and standing as an important local figure. A seventeenth century manor house on the Temple Newsam estate, Knostrop was once the home of Adam Bayes, MP for Leeds during the Commonwealth, but sadly was demolished in the 1960s.